How do you study muskox behavior? If you are Wildlife Conservation Society senior scientist Joel Berger, you dress up like a grizzly bear. How do you get to know rarely seen animals living in a remote part of the world? Some researchers view them from an airplane or capture and tag them to study. Wildlife biologist Joel Berger has another approach: He dresses up like a grizzly bear. Berger wants to know how the muskox — an ancient species that looks like a cross between a buffalo and a goat — handles stressful situations by studying what happens when a natural predator is around. “It’s hard to get inside the head of the animal,” says Berger. Joel Berger says that there are not as many interactions in the Arctic, unlike the Serengeti. What do you think he means by interactions? Why do you think their are fewer in the Arctic? What is Joel Berger’s research question? How is his research related to human interactions with our environment? 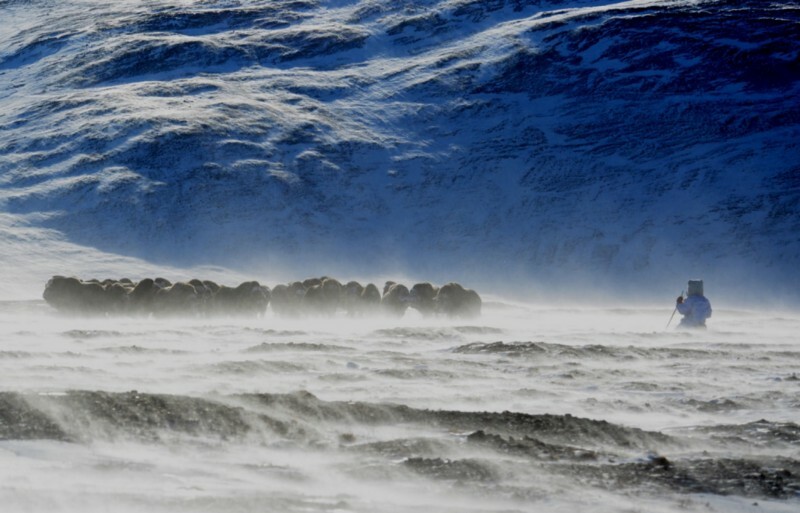 What adaptations do muskox have to living in the Arctic? What adaptations do muskox have to avoid predators? In addition to observing muskox reactions to the grizzly bear disguise, Berger also collects data on reactions to a caribou disguise. Why is this important to his research on the reaction of muskox to predators? How has technology improved Joel Berger’s ability to collect data on muskox? Have students do the Muskox Maneuvers activity that models the behavior of muskox herds when threatened. Have students alter the numbers to reflect the changes in bull population cited by Joel Burger, and then discuss changes to the behavior of the population and its survival rate. Whenever you use a modeling activity, have students discuss the limitations and assumptions of the model and suggest improvements. Have students investigate adaptations for arctic animals and then look specifically at how muskox are adapted to the arctic. Take a peek at Joel Berger’s research in this photo essay. Listen to Joel Berger talk more about the amazing muskox and his research into its reaction to natural predators. Next Generation Science Standards: LS2.A: Interdependent Relationships in Ecosystems, LS2.D: Social Interactions and Group Behavior, CC2: Cause and Effect: Mechanism and Explanation, and SEP2: Developing and Using Models. Can be used to build towards MS-LS2–4, HS-LS2–6 and HS-LS2–8. ​Xochitl Garcia @msxgarcia -Education program assistant @scifri and 2015 #grosvenorteacherfellow @NatGeoEducation. #STEM Educator obsessed with food and board games. Science Friday Spoonfuls @scifri ‏ - The latest and greatest science news from public radio’s Science Friday, ready for classroom use. What Happens When Meteors Hit Earth? What Would You Do If You Discovered A Volcano? How Can You Protect Yourself From Hackers? Can an origami creation remove a battery from your stomach? What do the humerus bones of Neolithic women tell us? What flies, dives and swims? What can we gain from useless knowledge? Which swim stroke is fastest?